According to a study published by scientists from the University of Toronto Scarborough and Aparna Labroo of Northwestern University, dimmed lighting can improve rationality and decision-making processes in humans. During the study, participants were asked to comment and rate several objects, images and characters. Researchers provided different lighting intensities during assessment, which influenced the results of the process. Based on the results, scientists were able to conclude that bright light stimulates people’s emotions and reactions, causing them to become intensified. Using the findings from the study, retail shops that offer products with deep emotional connections, such as flowers, jewelry, baby gear and wedding planning services, may find success in apply bright lights to generate emotional expressions in customers. Starting with 0-10V dimming, this analog protocol has been around for some time, initially adopted by businesses that use fluorescent fixtures. The technique incorporates a DC voltage control signal at a standard 0-10V scale for setting light intensity, with 10V offering full, 100 percent output; 5V providing 50 percent output and 0V providing zero (off) output. As a straightforward dimming method, 0-10V is not suitable for complex controls that go beyond light intensity, such as changing the output configuration of RGB diodes in colored LED lamps. A switch or relay is needed for lighting systems with limited power supply or ballast range, in order to turn the fixture completely off at the 0V setting. The concept of sink and source is used to facilitate 0-10V dimming. This refers to one component (either the control or the driver/ballast) offering the current – referred to as the source – and the other dissipating the current – commonly known as the sink. IEC 60929 Ballast Control Standard and ANSI C82.11 Ballast/Driver Control Standard cites the ballast/driver as the source, with the control sinking the current. This configuration is usually found in commercial and residential spaces. ANSI E1.3 Entertainment Lighting Control Standard, as established by the Entertainment Services and Technology Association (ESTA), reverses this dimming configuration. The control serves as the source and the ballast/driver becomes the sink. This configuration is suitable for controlling theater lighting systems, legacy devices and other systems that utilize the DMX standard. As the name suggests, 1-10V dimming will only dim the connected fixture down to 10 percent. To turn the luminary completely off, an external switch is required. It is important to highlight that the lowest possible setting for a 1-10V dimmer is 1V or 10 percent intensity output. In real life applications, a light that incorporates 1-10V dimming could come with a circular knob that controls dimming, as well as a standard light switch for settings beyond the dimming range, such as 0V (zero percent or off). By comparison, a luminary with a 0-10V dimmer may only come with a circular knob, which controls dimming levels and on/off functionality. Contrary to popular belief, 10-0V dimming is not the same as 0-10V dimming. The latter topology is established by the IEC 60929 Annex E standard, while the other is not defined by the institution. Like 0-10V dimming, this technique also leverages DC voltage signals. However, instead of a 0-10V scale for light output, it is inverted, with 1V offering maximum light output at 100 percent and 10V providing the lowest intensity setting. 10-0V dimming was widely applied in metal halide lamps. 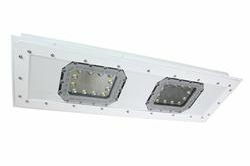 As metal halide fixtures started to decrease in popularity, so did this dimming option. PWM is a dimming method that is prevalent in LEDs that use constant-current drivers. This technique works by adjusting the duty cycle of the current, resulting in changes to the average current in the string. PWM is effective for accurate light dimming requirements, as it can handle high dimming ratios at 100 Hz (high frequency, so that the human eye cannot detect the flickering effect), with minimal effects to the LED color/color temperature. To achieve dimming, the LED is toggled at a very rapid rate. For instance, at the highest setting (full output), the LED stays “on” and is never toggled. At 75 percent dimming, the lights are only “on” 25 percent of the time. When plotted on a graph, shifts in current appear to be staggered, like a set of evenly spaced blocks or stairs without a long-term ascending or descending pattern (rates/values of dips/increases are constant). This type of dimming is ideal for lighting systems that need to be dimmed below 40 percent in a very consistent manner. PWM is suitable for color-mixing requirements, due to its precise dimming properties. Lastly, it can be incorporated in electronic systems via direct digital control.